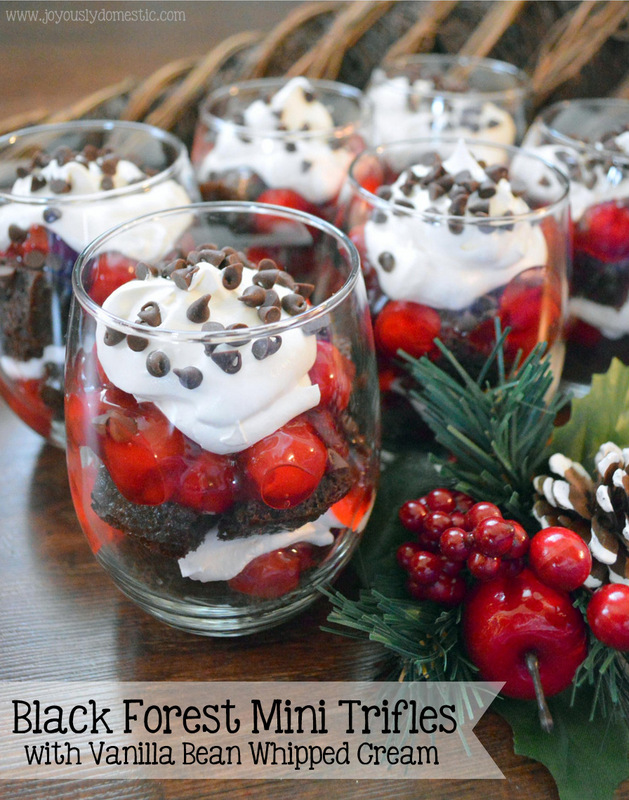 Black Forest Cake is one of my favorite desserts. My grandmother made it for birthdays and special occasions during my childhood. One of things that I loved about it was that it was served cold straight out of the fridge and that it had been made well in advance so that everything could meld together. I know that she made her version completely from scratch, but I've put together this recipe with a little help from store-bought items. You could, of course, make a chocolate cake using your own favorite recipe and/or prepare homemade whipped cream. But, I've found that this is a great avenue to take when I'm wanting to save on time, but still "wow" my guests with a decadent dessert. What I do recommend is that this be made in advance. I have found that making and assembling the trifles a day before service is ideal. Also, I brush my cooled cake with an amaretto simple syrup, but you could opt to make a simple syrup without the liqueur. It would simply be made with equal parts water and sugar. Note, also, that this recipe could be made into one large trifle instead of twelve mini trifles, if desired. Allow cake to completely cool on countertop after baking. Meanwhile, prepare the Amaretto Simple Syrup by combining 1/3 cup water and 1/3 granulated sugar in a small saucepan over medium-high heat. Cook until sugar has dissolved - stirring consistently. Once sugar is dissolved, cease stirring and bring mixture to a boil. Reduce heat to low while keeping mixture at a simmer. Cook until mixture has thickened slightly. This should take about 4 - 5 minutes. Remove pan from heat. Carefully stir in 2 tablespoons of almond liqueur, such as Amaretto. Completely cool syrup to room temperature. Once cake and simple syrup have cooled, brush syrup onto cake. Allow cake to rest for a few minutes, then cut into about 1-inch cubes/chunks. Set aside. Meanwhile, split vanilla bean lengthwise into two halves. Using a small knife, scrape out the "seeds" of the inside of the vanilla bean halves. Gently fold the seeds into the whipped topping. Set aside. To assemble the trifles, line up 12 glasses (mine were 15-ounce stemless wine glasses). Equally distribute half of the cake chunks between the twelve glasses. Next, place a dollop or two of cherry pie filling on top of the cake chunks. Then, spoon on a large dollop of whipped topping. Repeat all three layers once again, then sprinkle on mini chocolate chips or shaved chocolate. Cover each glass tightly with plastic wrap and store in refrigerator until time of service. Best made one day in advance, but trifles will keep in refrigerator for 3 - 4 days. Best served cold.